Following the death of newspaper mogul William Randolph Hearst, ace reporter and editor Jake Weaver finds himself a murder suspect while trying to help Hearst’s lover Marion Davies receive her fair share of the old man’s fortune. The effort also puts Weaver sideways with Bill Hearst Junior, his soon-to-be boss. Meanwhile, Weaver’s friend, young Marine Corps officer Kenny Nielsen, goes into battle in the Korean War while his wife Claudia seems to be paying more attention to her professional ambitions than to him. 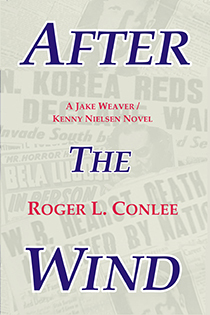 “After the Wind” is another gripping historical novel from Roger Conlee. After the death of American newspaper giant William Randolph Hearst, ace reporter and editor Jake Weaver tries to help Marion Davies, Hearst’s longtime lover, receive her fair share of the old man’s fortune. That effort puts Weaver in jeopardy with Bill Hearst Junior, who despises the former actress and soon will be his boss. Plus, it leads to Weaver being a murder suspect. Meanwhile, his friend, Marine Corps officer Kenny Nielsen, goes into battle in the Korean War. During his absence and later convalescence, Kenny’s wife Claudia seems more interested in her pre-med studies to become a physician than to her husband. Is Kenny just chasing after the wind?